Departure Point: Rome. Also Naples. Other departure points available. Please inquire. Pompeii, Amalfi Coast, Sorrento Tours Include: Our Pompeii, Amalfi Coast and Sorrento tours from Rome include private transportation, entrance tickets to Pompeii, service of expert tour guide for Pompeii, services of English speaking driving guide, taxes, tolls, and parking. 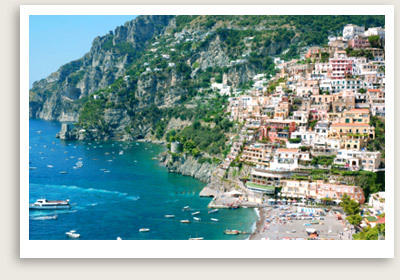 A great day trip from Rome to tour Sorrento, Pompeii and the beautiful Amalfi Coast to Positano and town of Amalfi. Enjoy one of the best day tours from Rome – Pompeii, Amalfi Coast Sorrento tour. Your English speaking driving guide will first take you to the lost city of Pompeii. Thirty feet of hot mud and volcanic ash buried this Roman city completely when Mt. Vesuvius erupted in 79 A.D. You will have a detailed private walking tour of Pompeii, once a prosperous trading center, established in 12th century B.C. With your expert Pompeii tour guide, you will explore this magnificent Roman city, its streets and squares, public buildings (temples, spas, theaters and the amphitheater), storefronts, houses, pizza parlors, and other artifacts from Pompeii’s heyday. Next on your private tour is Sorrento, a charming city perched on a bluff overlooking the Mediterranean Sea. Sorrento’s impressive seaside cliffs and luxury hotels have attracted such famous personalities as Luciano Pavarotti. You’ll enjoy the local scene as your tour guide takes you through the piazzas and narrow streets filled with tempting shops and tasty restaurants. You will also visit a fragrant lemon and orange grove, where you can sample and purchase limoncello, a local lemon liqueur, among other products. From Sorrento, your tour guide takes you on a private tour of the Amalfi Coast, whose stunning views will wow you. Your final destination is picture-perfect Positano, a classy resort town with trendy boutiques, alluring cafes, and a nice beach to get your feet wet. A perfect ending to a fabulous private tour of the Amalfi Coast, Sorrento and Pompeii.